Fit Fluential Mom: Sweet, Salty or Spicy Pumpkin Fries! Oh how yummy!! 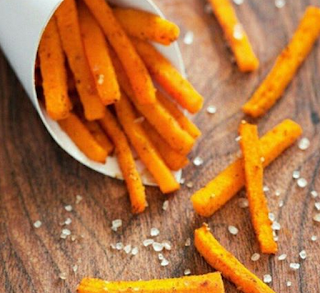 I love sweet potato fries but these are even better! Have you tried these babies?!? ‣ Place your cut pumpkin and olive oil in a mixing bowl. ‣ Toss by hand until the pumpkin is well coated in all the oil and spices. ‣ Place your cut pumpkin into a mixing bowl. ‣ Add maple syrup and toss by hand until your pumpkin is well coated. Ever heard of bananas being touted as nature's energy bar? Turns out, a cup of cooked pumpkin has more of the refueling nutrient potassium, with 564 milligrams to a banana's 422. So enjoy! Via Clean Food Crush Rachel!